The next set of parts you need to build your robot is sensors. Some are cheap and easily available, such as microphones, contact switches or LDRs, while others such as ultrasonic distance sensors or LiDAR’s may cost a lot more. One source of cheap sensors are car parking assist transducers. An aftermarket parking sensor kit usually consists of four transducers, a control box, cables and display. Using a logic analyzer, [Isabelle] shows how you can poke around the output port of the control box to reverse engineer the data stream and decipher the sensor data. Once the data structure is decoded, you can then use some SPI bit-banging and voltage translation to interface it with the Raspberry Pi. Using the Pi makes it easy to add a cheap web camera, microphone and speakers to the Hoverbot. Ikea is a hackers favourite, and offers a wide variety of hacker friendly devices and supplies. Their catalog offers a wide selection of fine, Swedish engineered products which can be used as enclosures for building robots. [Isabelle] zeroed in on a deep, circular plastic tray from a storage table set, stiffened with some plywood reinforcement. The tray offers ample space to mount the two motors, two castor wheels, battery and the rest of the electronics. Most of the original hardware from the hoverboard comes handy while putting it all together. While regular Hackaday readers already know how to blink a LED with a microcontroller and have moved onto slightly more challenging projects such as solving the Navier-Stokes equations in 6502 assembly, that doesn’t mean there’s not space for newbies. [Rik] has published a great tutorial on abusing DMA for blinkier glowy things. Why would anyone want to learn about DMA techniques? For blinkier glowy things, of course. This tutorial assumes knowledge of LED multiplexing and LED matrices, or basically a bunch of LEDs connected together on an XY grid. The naive way to drive an 8×8 grid of LEDs is attaching eight cathodes to GPIO pins on a microcontroller, attaching the eight anodes to another set of GPIO pins, and sourcing and sinking current as required. The pin count can be reduced with shift registers, and LED dimming can be implemented with PWM. This concludes our intensive eight-week Arduino course. Thanks to microcontrollers that aren’t trapped in the 1980s, new techniques can be used to drive these LED matrices. Most of the more powerful ARM microcontrollers come with DMA, a peripheral for direct memory access. Instead of having the CPU do all the work, the DMA controller can simply shuffle around bits between memory and pins. This means blinker projects and glowier LEDs. [Rik]’s method for DMAing LEDs includes setting up a big ‘ol array in the code, correctly initializing the DMA peripheral, and wiring up the LED matrix to a few of the pins. This technique can be expanded to animations with 64 levels of brightness, something that would take an incredible amount of processing power (for a microcontroller, at least) if it weren’t for the DMA controller. The setup used in these experiments is an STM32F103 Nucleo board along with the OpenSTM32 IDE. [Rik] has released all the code over on GitHub, and you are, of course, encouraged to play around. In the last episode, I advocated a little bit for Forth on microcontrollers being a still-viable development platform, not just for industry where it’s usually seen these days, but also for hackers. I maybe even tricked you into buying a couple pieces of cheap hardware. This time around, we’re going to get the Forth system set up on that hardware, and run the compulsory “hello world” and LED blinky. But then we’ll also take a dip into one of the features that make Forth very neat on microcontrollers: easy multitasking. Mecrisp-Stellaris Forth runs on a great number of ARM microcontrollers, but I’ll focus here on the STM32F103 chips that are available for incredibly little money in the form of a generic copy of the Maple Mini, often called a “STM32F103 Minimum System Board” or “Blue Pill” because of the form-factor, and the fact that there used to be red ones for sale. The microcontroller on board can run at 72 MHz, has 20 kB of RAM and either 64 or 128 kB of flash. It has plenty of pins, the digital-only ones are 5 V tolerant, and it has all the usual microcontroller peripherals. It’s not the most power-efficient, and it doesn’t have a floating-point unit or a DAC, but it’s a rugged old design that’s available for much less money than it should be. Similar wonders of mass production work for the programmer that you’ll need to initially flash the chip. Any of the clones of the ST-Link v2 will work just fine. (Ironically enough, the hardware inside the programmer is almost identical to the target.) Finally, since Forth runs as in interactive shell, you’re going to need a serial connection to the STM32 board. That probably means a USB/serial adapter. This whole setup isn’t going to cost much more than a fast food meal, and the programmer and USB/serial adapter are things that you’ll want to have in your kit anyway, if you don’t already. You can power the board directly through the various 3.3 and GND pins scattered around the board, or through the micro USB port or the 5V pins on the target board. The latter two options pass through a 3.3 V regulator before joining up with the 3.3 pins. All of the pins are interconnected, so it’s best if you only use one power supply at a time. Dev boards sporting a powerful ARM microcontroller are the future, despite what a gaggle of Arduino clones from China will tell you. Being the future doesn’t mean there’s not plenty of these boards around, though. The LeafLabs Maple has been around since 2009, and is a fine board if you want all that Processing/Wiring/Arduino goodies in a in an ARM dev board. The Maple has been EOL’d, and that means it’s time for a few new boards that build on what LeafLabs left behind. 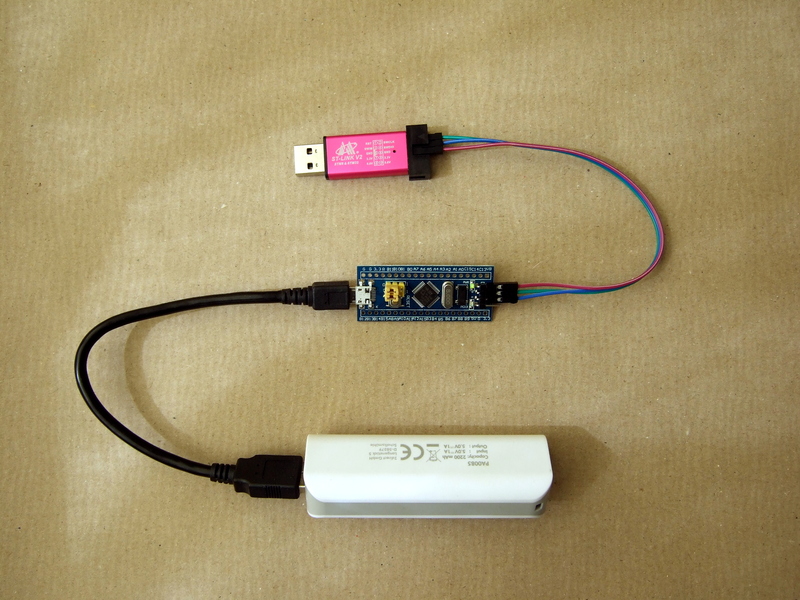 This Hackaday Prize entry is for an almost-clone of the Leaflabs Maple Mini. It sports a newer microcontroller, but still has the same bootloader and pinout. The best part? It costs less than four dollars. The microcontroller inside this Maple Mini clone is the STM32F103, a 32-bit ARM Cortex-M3 running at 72 MHz with 128K of Flash and 20K of SRAM. That’s enough for just about everything you would want to throw at it. It also follows the pinout of the original Maple Mini, and the team also has a version that’s a slight improvement of the original Maple. The big deal is, of course, the price of the board. It’s four bucks, or about the same price as an Arduino clone from the usual online retailers. Now, finally, there’s a reason for you to wash your hands of the Arduino too. DEF CON 24 is still about two weeks away but we managed to get our hands on a hardware badge early. This is not the official hardware — there’s no way they’d let us leak that early. Although it may be unofficial in the sense that it won’t get you into the con, I’m declaring the AND!XOR badge to be officially awesome. I’ll walk you through it. There’s also a video below. 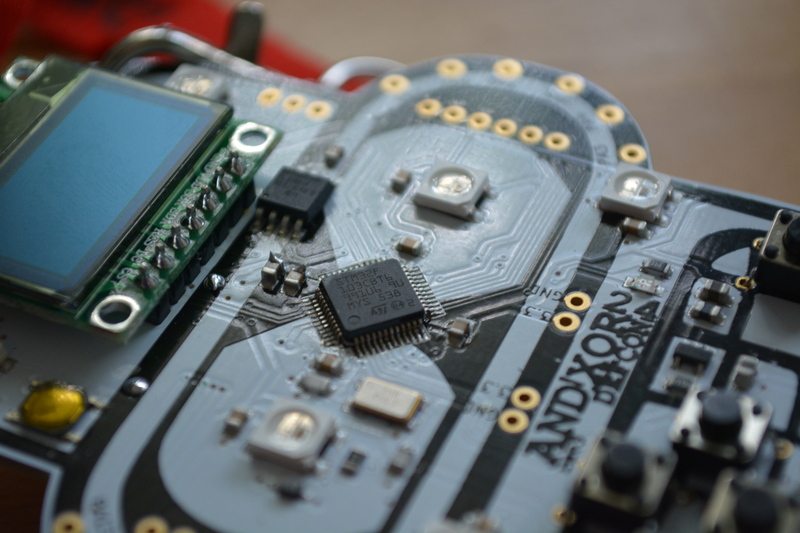 Over the past several years, building your own electronic badge has become an impromptu event. People who met at DEF CON and have been returning year after year spend the time in between coming up with great ideas and building as many badges as they can leading up to the event. This is how I met the trio who built this badge — AND!XOR, Andrew Riley, and Jorge Lacoste — last year they invited me up to their room where they were assembling the last of the Crypto Badges. Go check out my guide to 2015 Unofficial DEF CON badges for more on that story (and a video of the AM transmissions that badge was capable of). The outline is this year’s badge is of course Bender from Futurama. Both eyes are RGB LEDs, with another half dozen located at different points around his head. The microcontroller, an STM32F103 ARM Cortex-M0 Cortex-M3, sits in a diamond pattern between his eyes. Above the eyes you’ll find 16 Mbit of flash, a 128×64 OLED screen, and a reset button. The user inputs are five switches and the badge is powered by three AA batteries found on the flip side. That alone makes an interesting piece of hardware, but the RFM69W module makes all of the badges interactive. The spring coming off the top of Bender’s dome is a coil antenna for the 433 MHz communications. I only have the one badge on hand so I couldn’t delve too deeply what interactive tricks a large pool of badges will perform, but the menu hints at a structure in place for some very fun and interesting applications. Generating VGA is a perennial favorite on the Hackaday tips line, and it’s not hard to see why. Low-res video games, of course, but sending all those pixels out to a screen is actually a pretty challenging feat of coding. The best most project have attained is the original VGA standard, 640×480. Now that we have fast ARMs sitting around, we can bump that up to 800×600, like [Karl] did with an STM32F4 Discovery board. The problem with generating VGA on a microcontroller is the pixel frequency – the speed at which pixels are shoved out of the microcontroller and onto the screen. For an 800×600 display, that’s 36 MHz; faster than what the 8-bit micros can do, but a piece of cake for the STM32F4 [Karl] is using. [Karl] started his build by looking at the VGA project Artekit put together. It too uses an STM32, but a 36-pin F103 part. Still, it was fast enough to generate a line-doubled 800×600 display. [Karl] took this code and ported it over to the F4 part on the Discovery board that has enough space for a full 800×600 frame buffer. With all that RAM on board the F4 part, [Karl] was able to expand the frame buffer and create a relatively high-resolution display with DMA and about a dozen lines of code. It looks great, and now we just need a proper application for high-resolution VGA displays. Retrocomputing? A high-resolution terminal emulator? Who knows, but it’s a great use for the STM32. If circles and some text aren’t your thing, Artekit also has Space Invaders running on the 36-pin STM32.